Power showers give a wonderful shower of heated water and are ideal for homes where there is low water pressure from the water storage tanks. Fitting a shower pump, and the other parts, will overcome low water flow rate and also remove the effect of the shower flow dropping when water is drawn off in another part of the premises. Once connected, the pump will automatically operate every time the shower is turned on. Where the pump is built-in with the mixer unit fitted to the wall of the shower and fed with hot and cold water. 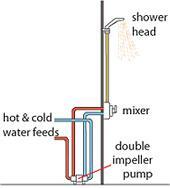 Where a single impeller pump is fitted between the mixer and the shower head. Where a double impeller pump is fitted between the water supplies and the mixer. These units combine the mixing valve and the pump in one unit. The valve mixes the hot and cold water to achieve the desired water temperature, whilst the pump boosts the flow of water to give a powerful and invigorating shower. The unit can be placed within a shower enclosure or over a bath. These are not very common in new installations as they are not very versatile and modern double impeller pumps cost very little more. The mixer is fed with the hot and cold water from the tanks and the pump between the mixer and shower head boosts the flow of water. The pump needs to be installed close to the shower head, often above. By far the most versatile, a single double impeller pump can serve a number of showers (providing they are not all used at the same time) and also the hot and cold water supply to baths, basins etc. The pump is fed with the hot and cold water from the tanks and boosts the flow of water to the shower mixer or other outlets. You can basically end up with high pressure water supply for all showers and taps rather than possibly poor pressure gravity feed from your tanks. Power showers do not heat the water, just move the water by pump to the shower head. The common aspects of all three types are that they require tank fed hot and cold water - they cannot be fitted to combination boilers or, generally, other forms of mains pressure water heating. They all require an electrical feed for the pump, some use low voltage pumps requiring a mains transformer (usually supplied) although most are fed directly from the mains. Under part P of the Building Regulations, the electrical connections can only be made by a competent, qualified electrician. A 'Surrey' or 'York' flange should be fitted in the outlet from the hot water tank. These fit into the standard hot water tank outlets but draw the water from below the very top of the tank to avoid drawing off the aerated water. Air in the water will cause problems with the pump. The water flow from Power Showers is greatly increased by the pump and it is likely to draw water from the tanks faster than it can be replenished from the water mains - so it is important to have reasonable sized tanks - at least 180 litre (40 galls), but ideally 225 litres (50 galls). As a rule of thumb, 2 litres of hot water are used for every litre of cold water. Power Showers usually give higher water flows that gravity feed or electric mains showers, so give some thought to the depth of shower tray and waste fitted, these may need to be changed to ensure that the water flows away efficiently.